Firstly, this remaster of this 1983 release has a vastly superior sound to that of the previous year’s “Tug Of War” and I feel this a better album too. 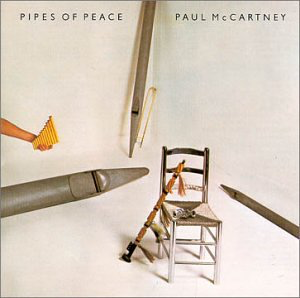 The first two tracks are very well known - “Pipes Of Peace”, which for no apparent reason is known as a Christmas song and the funky, surprisingly good duet with Michael Jackson, “Say Say, Say”. “The Other Me” is a quirky, attractive little very McCartney-esque song, while “Keep Under Cover” is jaunty, upbeat song with an extremely ABBA-derived keyboard riff. It could have come from “Money Money Money”. This isn’t a bad song. A good rocking vocal and some good guitar too.“So Bad” is a typical 80s lush, synthesised ballad and, for many people it is this sort of material, and the use of electronic instrumentation throughout the album that renders it a far worse album than “Tug Of War”. I agree that in many respects it represents the worst of the 80s - saccharine, commercial, every electro-dominated throwaway songs. However, for some reason, I quite like it and prefer it to its predecessor. Maybe it is just the sound quality, but maybe I just prefer the songs too. “The Man” is another duet with Michael Jackson - catchy, upbeat and summery, with McCartney trying his best to match Jackson’s falsetto. “Sweetest Little Show” is again very catchy and jazzy, with nice acoustic guitar solo. Thinking about it, I certainly don’t find this album as blatantly “electro” as some contemporary critics seemed to. “Average Person” sounds quite Beatles-ish to me. Yet again, impossibly catchy. A critic at the time said the latter two tracks were “a nice one-two punch of refreshing creativity that give the proceedings a much needed spark of interest and vitality”. I have to agree. 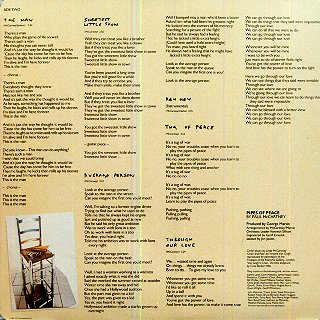 “Hey Hey”, an upbeat instrumental, has more than an air of Elton John’s “Crocodile Rock” about it in its first half. The more one listens to Paul McCartney’s post-Beatles work, the more one spots the purloining of riffs and passages from other songs. 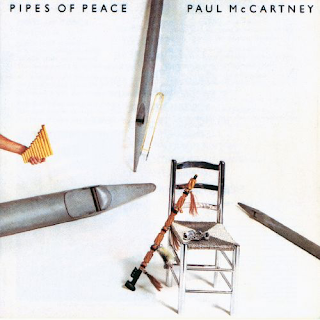 “Tug Of Peace” has a nice sounding drum intro with great stereo sound. The track has great rhythm and another good bass line, but as a song it doesn’t really get anywhere. It has a good vibe though. “Through Our Love” is a nice, slow closer but very over-synthesised. Maybe that’s where the opinions about synthesisers comes from. This is a pleasant album, not nearly as bad as people say, but, unfortunately, it will always be the case that any work of Paul McCartney’s is measured against his Beatles output.